Maps are guides or drawings that help people locate something, find travel directions, or understand an area. There are many kinds of maps — road maps help us find our way; topographical maps show land elevations; geological maps show the locations of natural resources; relief maps show landforms; thematic maps show patterns such as population density, climate, or vegetation. Topological maps show information without regard to correct distances or geographic attributes. Maps are generally presented with the north facing upwards, the south facing downwards, the west facing toward the left, and the east facing toward the right. Maps use a system of longitude and latitude. Lines of latitude run across the map and are called parallels. Lines of longitude, on the other hand, run from the North Pole to the South Pole and are called meridians. While each latitude line is parallel to every other latitude line, no two lines of longitude are parallel to each other. Instead, lines of longitude are about 70 miles apart at the equator. From there they converge progressively until they come together at the two poles. 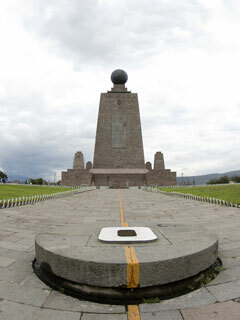 The equator, whose latitude is zero degrees, divides the world into the Northern Hemisphere and Southern Hemisphere. In contrast, the Prime Meridian, which is at longitude zero degrees, divides the world into the Western Hemisphere and the Eastern Hemisphere. The Prime Meridian is an internationally established reference line that passes from north to south through the Royal Greenwich Observatory in London, England. How are lines of latitude and longitude numbered? Well, starting from the equator, each degree of latitude, which is represented by a line, is numbered to the north and to the south. These lines go as far as the North Pole, at 90 degrees North latitude, and the South Pole, at 90 degrees South latitude. Lines of longitude are similarly numbered, but eastward and westward to the 180th meridian — located on the opposite side of the globe from the Prime Meridian. When you combine latitude and longitude, you get a grid that geographers call a graticule. The locations on a map are indicated by correctly identifying the grid coordinates on the graticule. When naming the coordinates, the latitude is given first, followed by the longitude. When the latitude is referenced, it must be specified whether the location is north or south of the equator. Similarly, when the longitude is referenced, it must be specified whether the location is east or west of the prime meridian. In recent years, several mapping algorithms have been developed to chart and describe the best routes to travel between geographic locations. Taking into account such factors as distance, speed limits, and traffic congestion, these sophisticated programs produce remarkably accurate results for popular driving directions sites such as Mapquest, Google Maps, Yahoo Maps, and Windows Live Local. This site, MapsAndDirections.us, features a convenient directory of online map and driving direction resources as well as United States and World atlases. 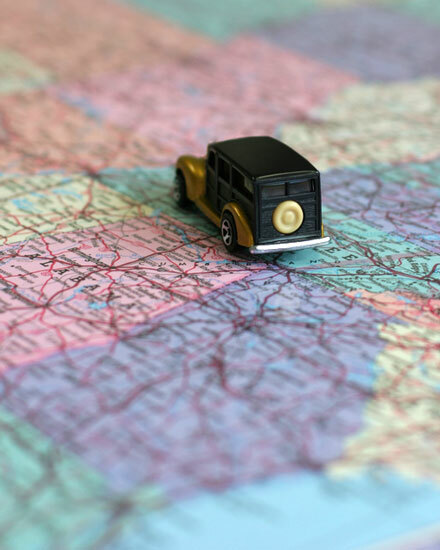 The scrollable state maps show cities and towns as well as Interstate, Federal, and State highways; they can be printed in sections and used as travel maps. The website also features an overview of map projections, including four world map examples that illustrate cylindrical and azimuthal projections. 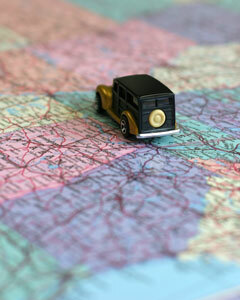 Map and travel store offers wall maps, travel maps, atlases, travel guides, globes, and more! This well-known map publisher offers maps, driving directions, travel store, and trip planning resources. This popular site provides online maps and driving directions, plus a road trip planning, mobile navigator, and GPS solutions. Features zoomable satellite and political maps plus a location finder and a business finder. Get directions from one place to another. The Yahoo Local Maps site features zoomable road maps and satellite maps, driving directions, and average travel times. Microsoft's Bing Maps site features maps and trip planning solutions plus quickest or shortest driving directions. Find Michelin maps and itinerary planner, as well as the green travel guide, red hotel/restaurant guide, and traffic information. Online dynamic atlas and street maps from National Geographic. Road maps and road atlases of US States and foreign countries as well as world atlases, wall maps, travel maps, and educational atlases. This distributor for the map publishing industry is a comprehensive source for maps and geographic information. Features an extensive collection of regional and national maps from the CIA World Factbook. This map portal features links to a wide range of world maps and United States map resources, including community and political maps as well as environmental, health, and historical maps. Learn where to purchase printed U.S. Government maps. Read about the continents of the world, view continental maps, and find convenient access to country maps, demographic facts, and statistical data. Printable outline maps, topographical maps and terrain maps of the USA plus road maps and topo maps of United States regions. State map directory features convenient access to political, topographical, and relief maps of each state in the United States of America. Features an interstate highway map of the United States plus descriptions, information resources, printable outline maps, and photographs of each state in the USA. Continental map and travel information about North America. Learn about the physical features and demographics of the North American continent, as well as its popular travel destinations. Browse the maps and pictures of Canada and its provinces. View the detailed road maps of each Canadian province and learn about tourist destinations such as Niagara Falls and the Canadian Rockies.